Okay now on to the fitting, gluing and clamping. 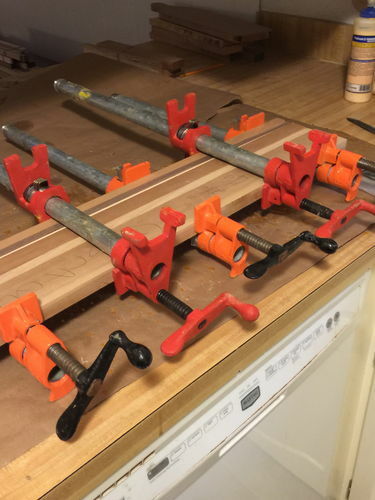 My admission is here that I use more clamps than necessary. Now that’s not a job killer – but it can seriously deplete your clamp store while you are doing a run of boards. The general rule of one clamp under, one clamp on top, one clamp under, etc. is basically what I follow. Let’s discuss the “elephant-in-the-room” issue first – clamping pressure. 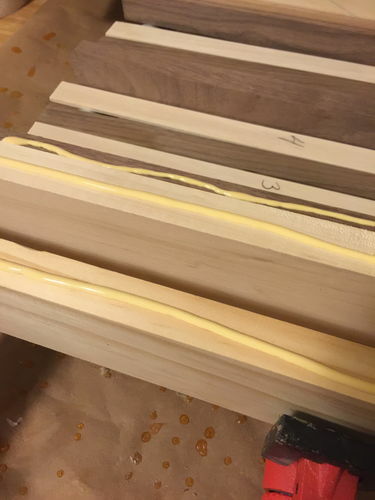 My general rule is a good fitting joint needs to have just enough glue to have a small bead of squeeze out, and just enough pressure to hold the piece together while the glue dries/cures. While these two elements might be hard to gauge – clamping pressure seems to be the hardest to get a handle on. The cranks on most clamps I think give you a false sense of how much is too much. I’ve seen guys in some of my classes I’ve taught and some of the ones I’ve taken be absolute gorillas in tightening clamps. 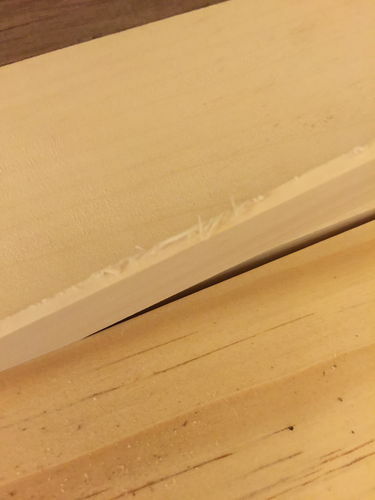 If your joints are good and you don’t start with too little glue – a snug fit is good enough. Being a gorilla in the wilds of Africa where your strength is the test of the top-gorilla, in the shop being a gorilla has the potential to starve your joint of glue leading to a failed joint. Snug is, of course, a subjective concept and hard to quantify. But my gauge is that I tighten the clamp until it contacts the wood and I can’t move the clamp from side to side. I then do an additional ½ to ¾ turn and stop. If you have zero squeeze out you may need to tighten a little more – HOWEVER, you may also have not used enough glue. 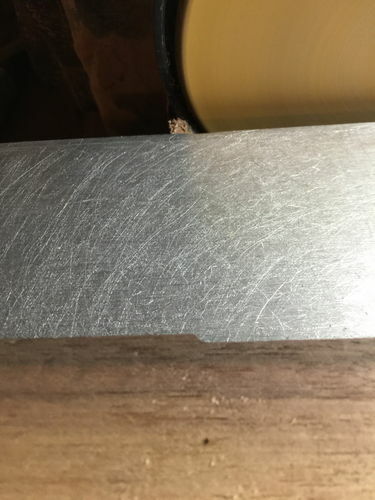 With all that said – there’s a lot more to clamping than my simple explanation – you have to take into account, the wood type (hard or soft), grain types, the type of joint and so on. It’s a subject all in itself and I’ve oversimplified it here. If you want to Google clamping pressure you’ll be inundated with articles, suggestions, opinions, etc. Just remember that you start small and build in your knowledge – if you are just starting in woodworking don’t out think yourself. A lot of this stuff is intuitive, some of it is learn-as-you-go, make a bum project, figure out what went wrong, or read and read and read. Can’t learn it all in one go or on one project. You can do the same with glue – you can drive yourself crazy looking at every article and every blog on the subject but really it comes down to try one, decide if it does the job for you, try another and so on. I’m not saying study up a little – but if all you do is read, watch, listen etc. you may not have time to do any actual woodworking. Don’t drown in the minutia. Now as to clamps – if you are using the pistol grip clamps – those are pretty flimsy and you will need to squeeze those are hard as you possibly can – gorilla away on those. But my opinion – on a board/panel/cabinet or whatever you want to be sure is clamped well stick with pipe clamps, bar clamps or the K-clamps. Pistol grips have their uses – but I don’t use them on my boards. 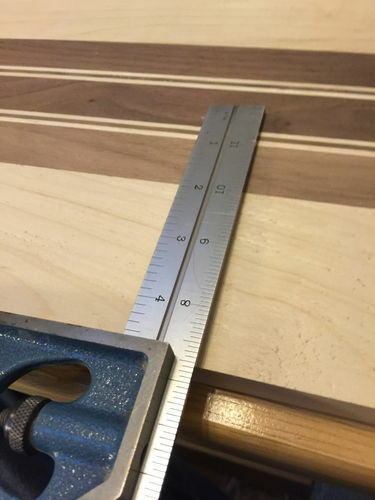 Long and short, a good joint, the right amount of glue and the correct clamping pressure are all three components that need to be used together to end up with a successful project. 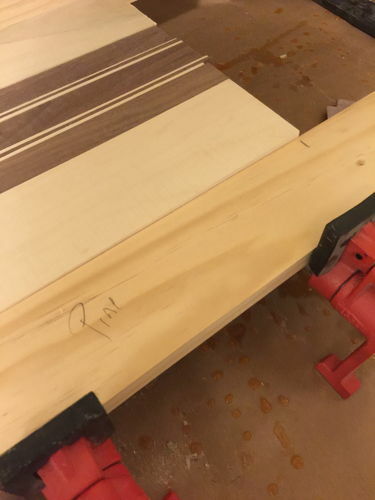 After setting up my clamps I do a dry fit – this is where you place your boards in the order you need onto the clamps, snug the clamps up and carefully look at the joints. You want to see if there are any gaps, knick or stray chips that may keep your joints from closing up correctly. My board has a fuzz issue. 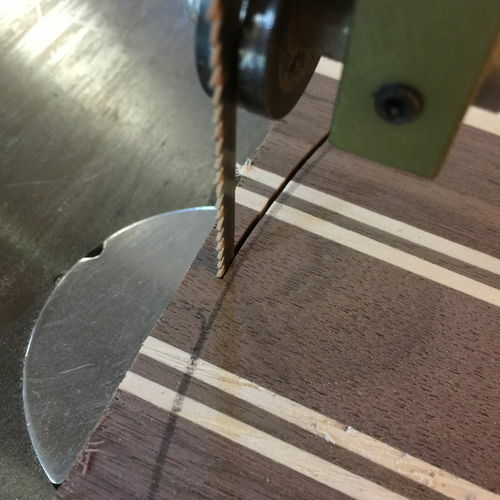 As you may recall from the first section of this blog – when I cut my thin strips they had fuzz on the edges. I pulled one slice up to show the fuzz. The fuzz has to go. This is a spot where you can really foul up your project. The fuzz needs to go but you just can’t hit it with sandpaper and make it go away – you have to sand it carefully. That means placing it on a hard, flat surface and lightly sanding it clean. 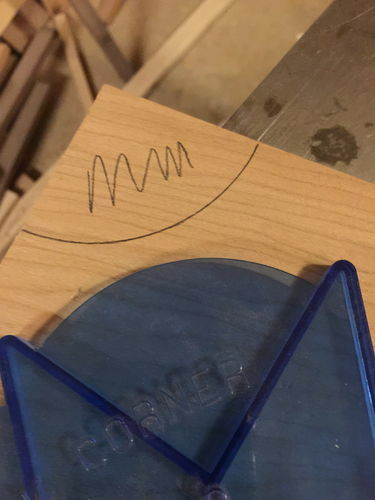 You don’t want to sand so much that you round the corners. If you round the corners you can end up with this. The photo is exaggerated – but if you round over the edges of your pieces you create a gap. 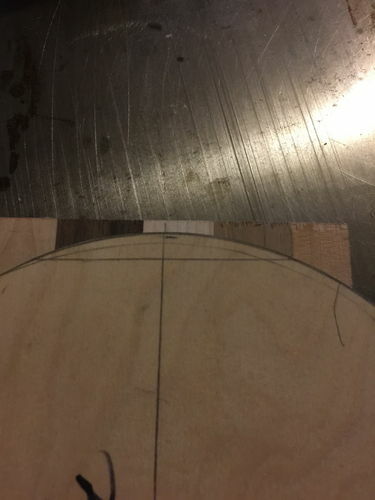 The gap can be overcome by sanding a great deal or planning the board down below the rounding but avoiding it is best. For the most part I use a block wrapped with paper. 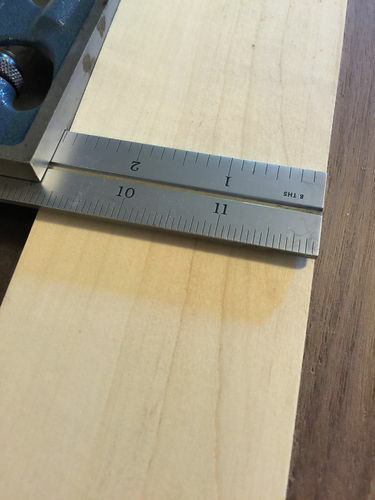 I use very light swipes and I try to sand evenly along the length. 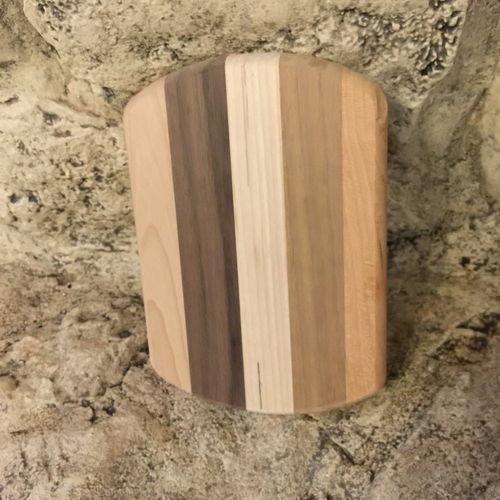 When you put it back after sanding you should look more like this (the board is not clamped – so there is a gap toward the bottom but you get the idea). So once you are sure that all of your joints are good with no fuzz or stray chips etc. it’s time to glue. 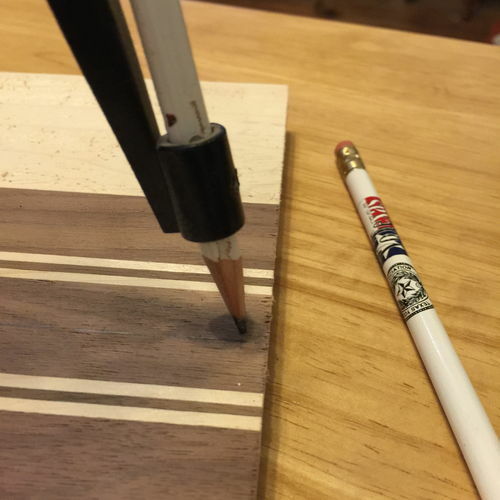 Every woodworker has her/his own theory on how to apply glue. Some use a gallon of glue on every joint, others use just barely enough. Try to find a happy medium. Too much glue leads to a ton of squeeze out that has to be dealt with (not to mention the expense), it takes the joint longer to cure and generally creates a mess. Too little glue can lead to what is called a starved joint, which is, essentially, a failed joint. Let me back up one step. You also need to consider where you are going to place the glue bead. 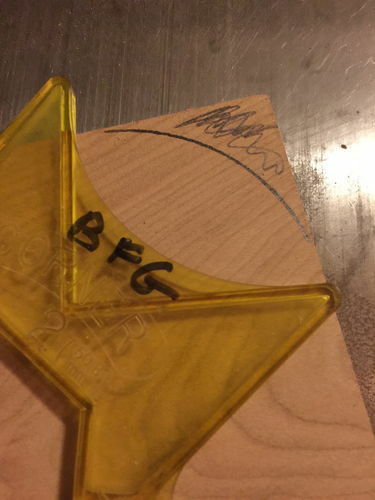 Some swear by putting glue on both sides of the work piece, others swear by gluing one side of each piece. I go with one side. I’ve never had a failed joint so I don’t see the need to use the extra glue. All that glue adds up over time and can eat into any profit margin you may be considering. 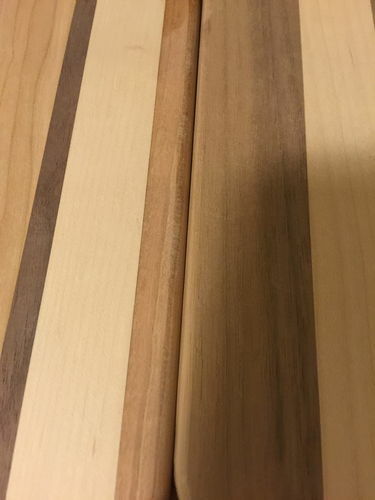 I start my glue up procedure by standing my boards on one edge. You’ll notice in the picture that I have marked “glue” or “g” on all the edges. I don’t do that all of the time but I did this time to illustrate where I intend to place my glue. You’ll also notice that I do not set the very last (furthest away) board on its edge. 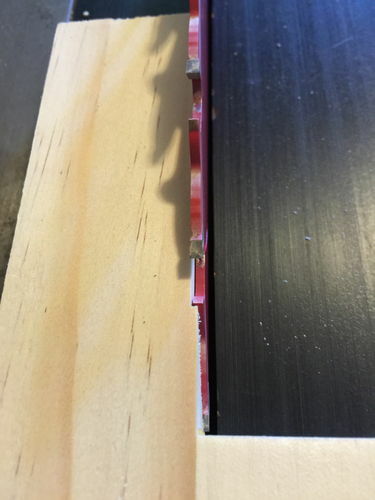 That board will not receive glue as it will get its glue from the board before. 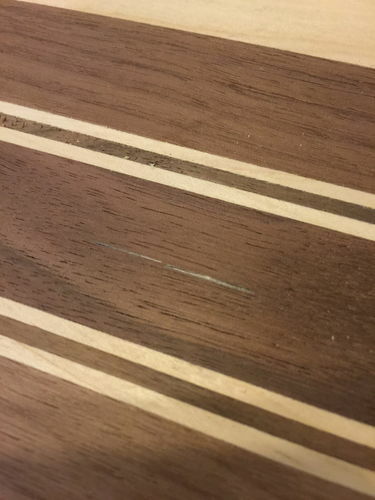 Once the glue is spread each board is then turned flat and the adjacent board butted against it. One other thing about my glue ups. 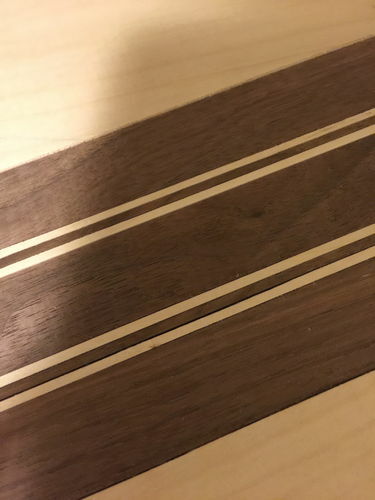 I add a waste piece on each end of my board blank. The waste piece is always about 4-6” longer on each end. (If my project board is 10 inches then I have 18” waste pieces.) 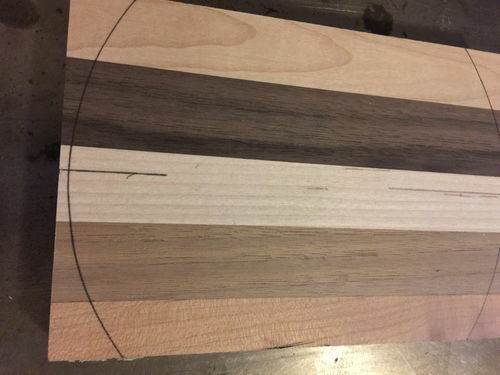 The reason for this is I will be putting the blank through the planer. 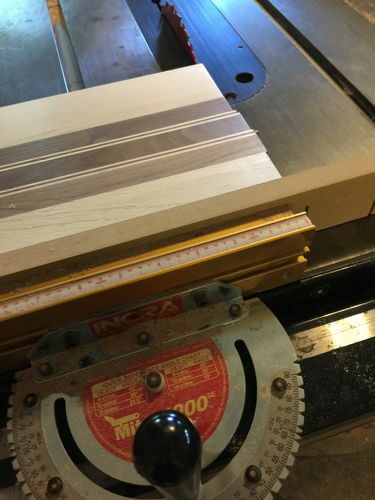 The extra length will take up any snipe that I may get from the planer knives – leading to less sanding which is always a good thing. Once all boards are put down flat I first pull in the center clamp and snug it up very slightly. Then I pull each end in and snug those up. Personally, I snug up each clamp a little at a time watching that I don’t accidently get a board to ride up above the level of the others. Once you start to snug up clamps you’ll notice that side-to-side slippage may occur. 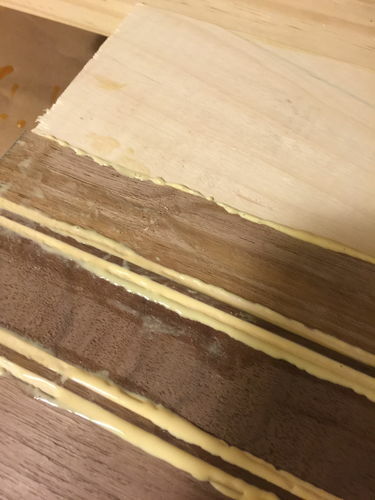 This is just the two boards sliding against each other with the wet glue. 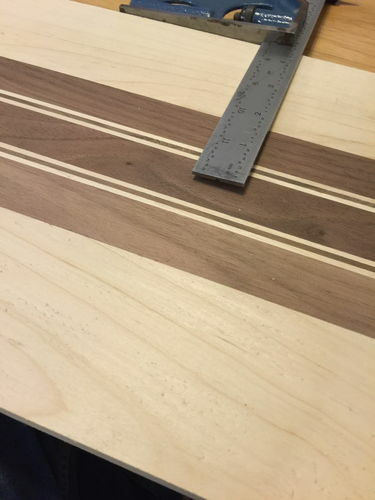 If you have some wiggle room in the length of your boards it’s not that big of a deal. But if you are very close to limit the of what you can cut then you just need to adjust for the slippage. 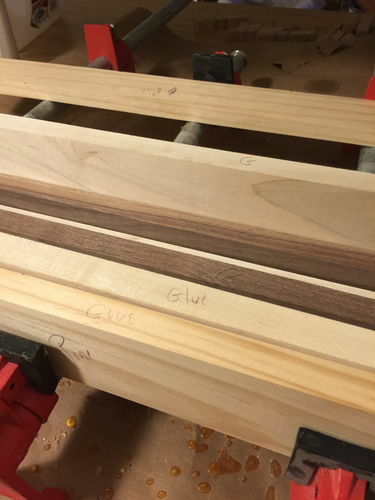 Another thing that some folks use are cauls on their glue ups and I do as well on the larger boards. For one this skinny I don’t use them. But it’s good to have cauls to work with. Now that I’ve snugged up my clamps you can see the squeeze out. You can see two levels of squeeze out. The line at the top is more like I want to have. The middle row is way too much for my taste. The picture just shows the difference. 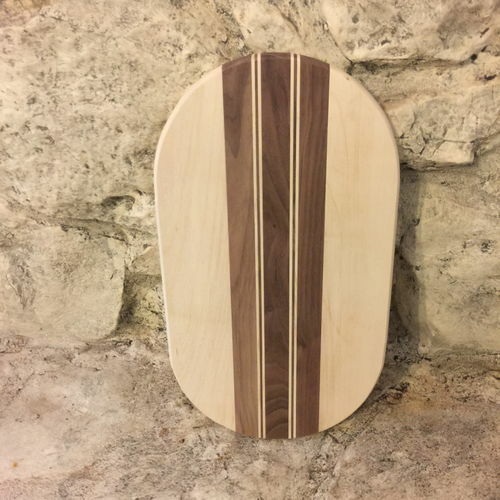 After I am sure my board is clamped to my satisfaction – I just set it aside. Once the glue dries I knock down any blobs of glue with a hand sander then get the board ready for the planner. You’ll notice in the previous pictures that my waste pieces are about 4” wide. That’s too wide for the planer. I used what I had, but now I need to cut those down to be able to fit into my planer. Once that’s done I head to the planer and run the board through until the surfaces are flat and smooth. I didn’t take any pictures of that – but will do so in the next section of the blog. Now it’s back to the table saw to cut off the waste. 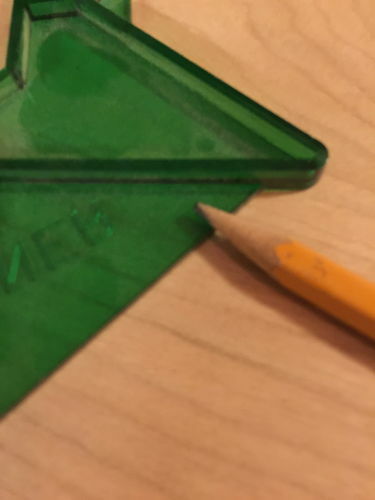 I set the blade to cut just a tiny bit off the edge of the waste and a tiny bit off of the work piece. After both waste pieces are cut off then I cross cut the uneven ends to square them up. 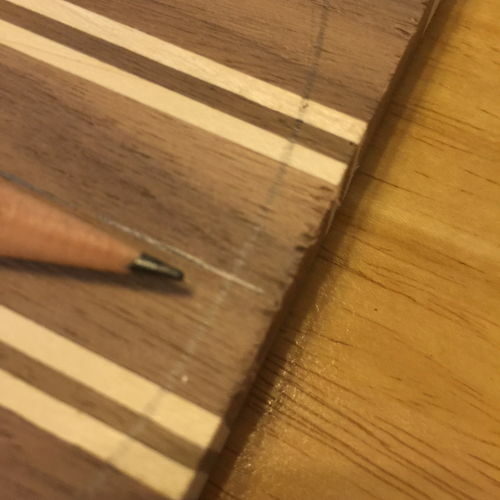 Finally, I check that both maple edges are the same width. This time they are not. 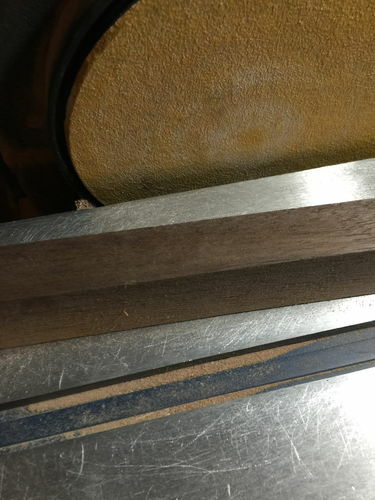 I use my square and bring the blade to the edge of the walnut, then snug up the nut and flip the square over to the other side. You can see in the picture that it’s off just a bit under 1/32. I take that edge back to the saw and nip off a bit and now it’s right on the money. 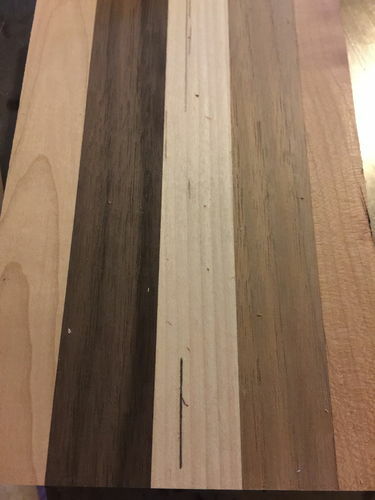 So now that I have the board to the length and width I’ve got to decide how I’m going to treat the corners – am I going with a complete square look, cut a rounded corner, an inside corner or an oval? These little templates are a great investment. I’ve had this set for about 15 years and I can tell you I’ve used one or another on almost every project I’ve done. 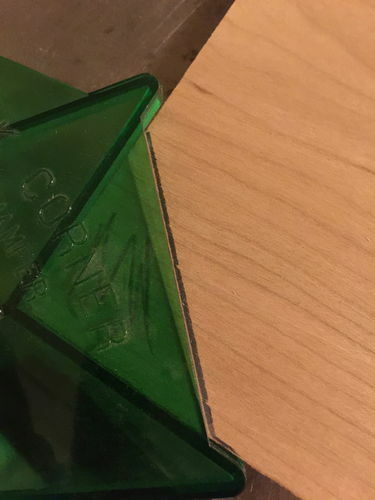 These templates make the following corners. 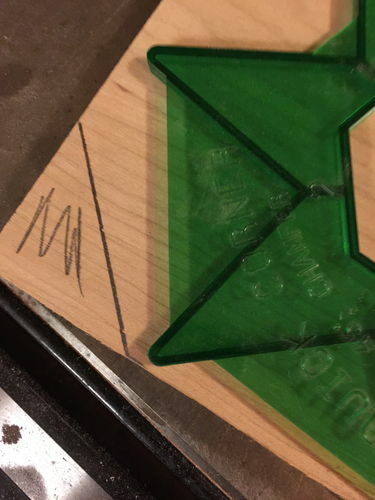 Each template has a lip that fits over the corner of your work piece. 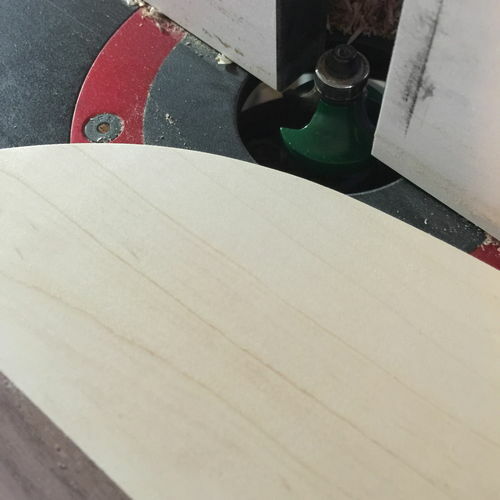 For this project I am going to go oval. This means I bring out the compass and a square. First you have to find dead center of the board. Simple enough measure the width, divide by two, set your square to that number, make a mark on the board THEN flip the square to the other edge and make another mark – if you are truly in the center your two marks will overlap. 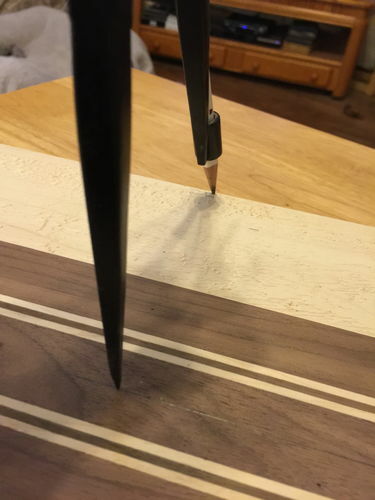 I place the pin part of the compass on the center line and stretch the pencil part to the edge of the board. I swing the compass around so that it hits just below the edge of the board. 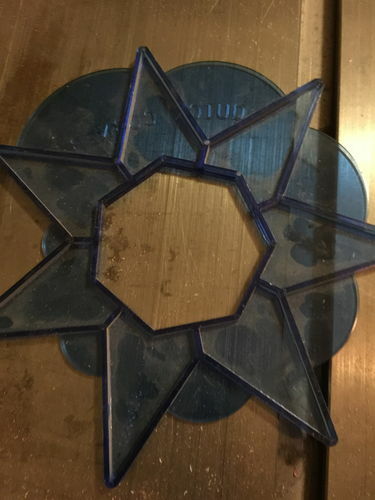 The reason I go just below the edge is that it’s easier to cut on the bandsaw with a little extra at the top. Once I decide that my compass mark is okay, I make the same mark on the other end. Then it’s off to the band saw. You’ll notice in the next photo that I cut just barley outside the line of my arc. Much less to sand off. If you go inside the line – it’s not a game breaker, just go back and swing a new curve and try again. 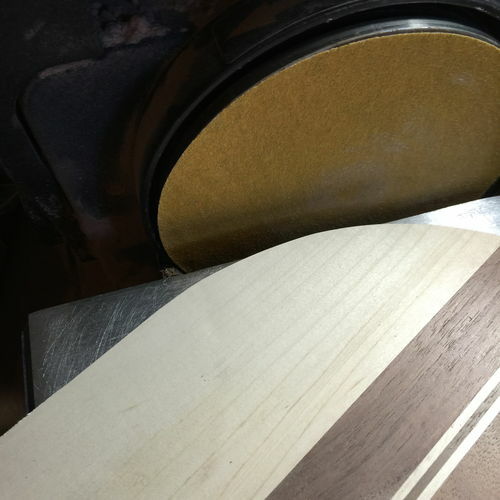 Then it’s off to the sander. My sander is just the run of the mill bench top sander. It does a good job. But there are dangers if you don’t watch what you are doing. 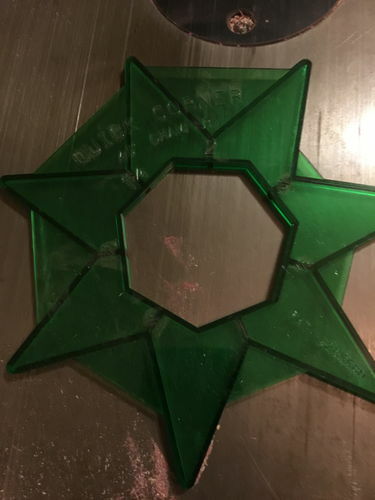 You’ll see the uneven chunk taken out of this junk piece. That’s because I pushed the board too hard and unevenly against the disc. This can be an issue if you have a particular size you are looking for. More times than not you can redraw your line and re-sand. 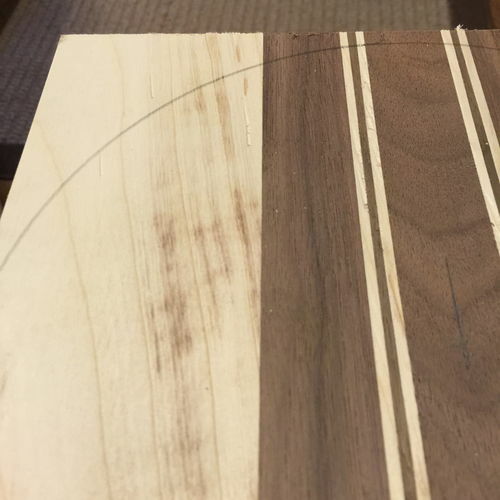 After I am satisfied with the sanding it’s off to the router to put on a round over. This is what I ended up with – not to shabby. That’s about it for this part of the project, but here’s a little side tidbit. While I was looking through my scrap box for a junk piece to show the sander picture above, I found a little cutoff from a prior project. I don’t throw much of any wood away. 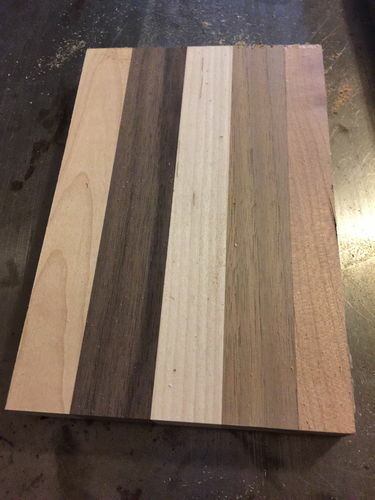 In no time at all I turned this little scrap into a small cutting board. 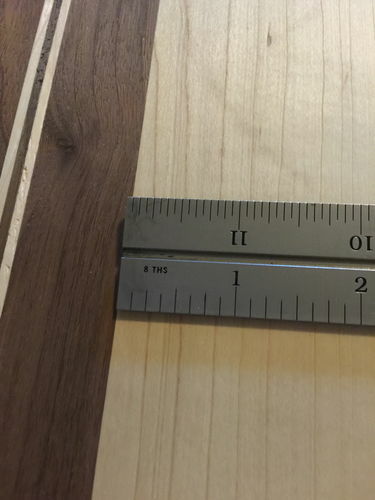 It’s about 7” x 4” – not anything more than small – but it’s good enough for the drawer for the one apple or one whatever that that you want to cut but not bring out the big board. It will probably be a stocking stuffer for a friend – or I just might keep it. Who knows! Okay that’s it for tonight. I know I tend on the side of verbose and I’ve probably left out some stuff and put too much of other stuff in – but I hope the above helps someone out a bit. Any questions, suggestions and comments are welcomed. Really like those radius templates, too! Thanks guys. I need to improve my picture taking a bit for sure. Lew those templates have been a good investment. Not sure how much they cost all those years ago, but I’ve gotten my money’s worth. TNX Great stuff, never too much..
We use, here in our shop, ( Retired folk) Tite Bond III for cutting boards. Thank you Betsy for taking the time to do this! Very informative. I also like Titebond III for my cutting boards. 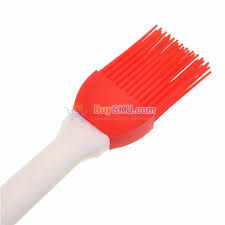 As to using acid brushes, I started realizing how many I was throwing away and switched to a simple silicone basting brush. Bought 2 at Wally World for .99 each about 2 years ago and still haven’t used the 2nd one yet. 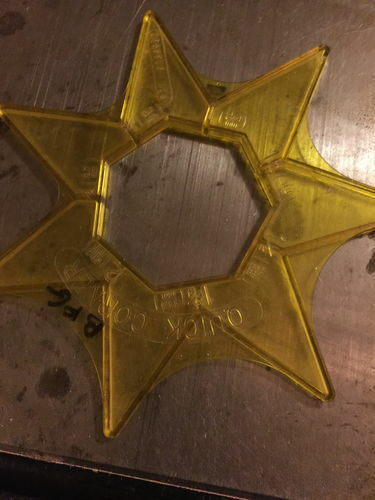 At first I was using it just as it was, and then laying it on a piece of cardboard to dry. But then you have to dig all the dried glue out of the bristles which wouldn’t come out in one chunk. I also noticed it was holding quite a bit of glue after use (which = more waste ). 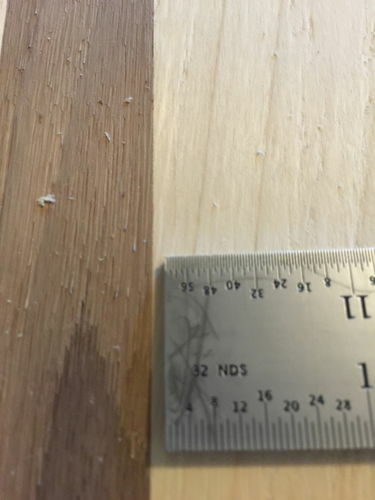 So using a razor blade, I cut the “bristles” down to about 3/4” long and now when I’m done spreading glue, I stand it upright on a scrap of wood, leaning the handle against a drill or can or anything tall enough to hold it upright. 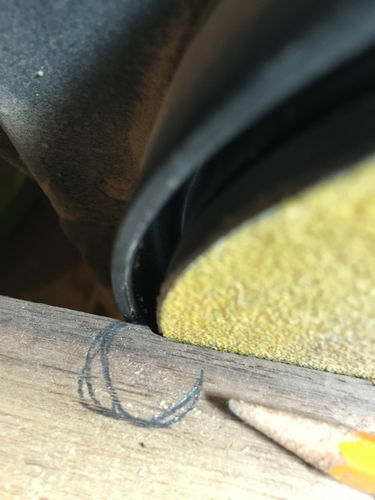 When it’s dry all I have to do is wiggle it back and forth a bit and it pops right out of the hardened glue which stays on the scrap wood. Works like a charm. Bruce and Joe – I stick with Titebond II – mostly because my local big boxes seem to have a hard time keeping III in gallon sizes in stock. As for the acid brushes – I don’t go through very many – I wash and wash and wash the brushes until most of the bristles are about worn out. I bought a bag of 25 three or four years ago and probably have 15 or so left. I actually do have one of those silicone brushes around – but have not used it very often. Vjeko – glad you can join us. Excellent blog. What is the correct name for the radius templates that you use? I have never seen them before but will be getting one soon. Really enjoying this blog and your pics are fine.